So, here is a list of the ten best independent bookstores in the world (based on their reader recommendations). Tulsa had a wonderful independent bookstore for years: the Lewis Meyer Bookstore . . . alas, it is no more. A bygone era . . . Lewis Meyer even had his own radio program (which ran for 42 years: The Lewis Meyer Bookshelf). The creativity of artists is not restricted to their artistic creations; it can also show up in the language they use. Take for example this quotation by Pablo Picasso . . . This is a perfect example of an artistic oxymoronica and is quite the paradoxical observation. “Artists don’t create reality; they only try to capture it through their contrived — and ultimately artificial — creations.” (Dr. Mardy Grothe). And, in perusing some of the other entries in oxymoronica by Dr. Mardy Grothe, I noticed that several shared the common themes of truth and lies (as did both of these Picasso oxymoronica). Hmm, most curious. I ran across this wonderful pattern in Southwest Airlines’ Spirit Magazine on a recent trip. I have not yet attempted to fold this pattern, but here are the directions for making an origami anteater using a dollar bill. Happy folding! Trivia in the Kitchen, Number Forty-Four! One of my favorite restaurants (the Bistro at Seville) serves an appetizer that is irresistibly delicious: Chokes and Cheese, an artichoke hearts, cream cheese and Parmesan cheese dip (served with triangles of pita bread). Believe it or not, I have never attempted to prepare artichoke hearts myself. Did you know that the artichoke is actually a variety of a species of thistle that is cultivated as a food? Native to the Mediterranean region, the top producers of artichokes are Egypt, Italy, and Spain. In the United States, California provides nearly 100% of the U.S. crop (80% of that is grown in Monterey County); Castroville, California proclaims itself to be “The Artichoke Center of the World” and holds a festival every year at the end of May. One of these days I will have to learn how to cook/prepare an artichoke. She Was Out of Control! Happy Friday! With the weekend rapidly approaching, let’s try to keep our consumption of intoxicating beverages in the moderate range. The last thing we need is an out of control maenad. 2. a frenzied or raging woman. So what exactly is a bacchante? A female bacchant. 1. a priest, priestess, or votary of Bacchus; bacchanal. Here’s the next installment of manners and etiquette (courtesy of the Goops)? Source: Goops and How to Be Them: a Manual of Manners for Polite Infants Inculcating Many Juvenile Virtues Both by Precept and Example by Gelett Burgess. I have long been a fan of the pun and have garnered more than my share of groans. But, sometimes, it just has to be done. Here are a few new ones that I just discovered. I will beg for forgiveness right now. Enjoy! Singing in the shower is all fun and games until you get shampoo in your mouth, then it just becomes a soap opera. I have a few jokes about unemployed people, but it wouldn’t matter, none of them work. Never trust atoms, they make up everything. I couldn’t work out how to fasten my seat belt, then it just clicked. To the guy who invented zero: thanks for nothing. Why does Peter Pan always fly? Because he Neverlands. Did you hear about the guy who got hit in the head with a can of soda? Lucky for him it was a soft drink. What do you do with a sick chemist? If you can’t helium, and you can’t curium, then you barium. The International Prize for Arabic Fiction (IPAF, also known as the “Arabic Booker”) was awarded to Shukri al-Mabkhout, a Tunisian university administrator, for his debut novel entitled The Italian. The prize: $50,000 was awarded in a ceremony in Abu Dhabi last month shortly after his publishers learned from an Abu Dhabi bookshop that the novel was banned from bookshops across the Emirates. How’s that for irony? The novel is set in Tunisia during the somewhat turbulent time and transitions between Habib Bourguiba’s 30-year rule (1957-1987) and Zine El Abidine Ben Ali’s 24 years in power (1987-2011) and follows the central character’s political and romantic adventures while at the same time taking a critical eye to life in Tunisia under two separate dictatorships. A Collector’s Portfolio, Part 3! Today marks the official beginning of summer (the summer solstice). 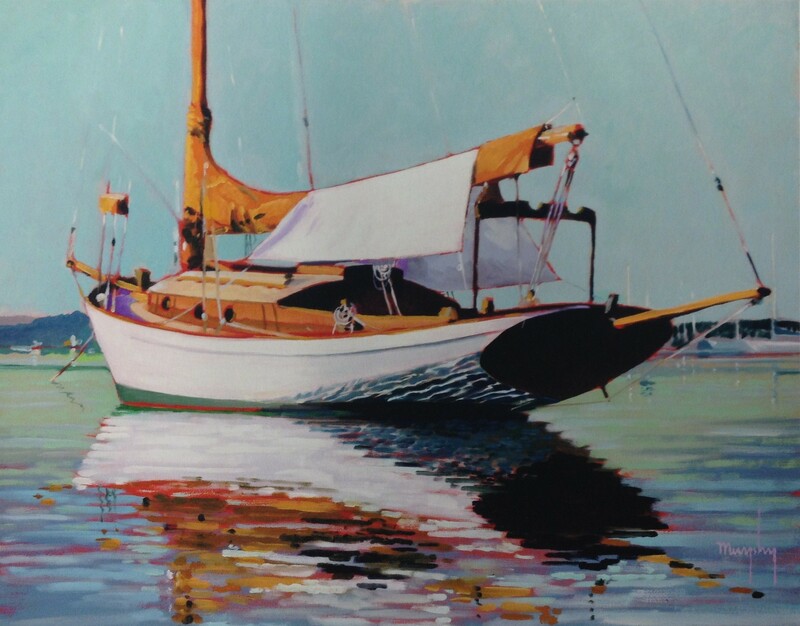 What an ideal day to post this painting which represent the perfect depiction of summer: vacations, water, a sailboat. This painting is the third (in a series of eight) signed and numbered, limited edition (250) giclee print from “The Art of Charles R. Murphy: a Collector’s Portfolio” that I acquired last summer, while vacationing in the Traverse City, Michigan area. The serenity of this piece and the setting are quite reminiscent of my time growing up in Northern Michigan (Leelanau and Grand Traverse Counties specifically). The title: “At Rest” (most fitting, don’t you think? ), the artist: Charles R. Murphy, the medium: giclee print, the enjoyment: on-going!